Discussion in 'Mapping Questions & Discussion' started by Sgt Frag, Feb 10, 2009. This came up during the payload contest playtime on Sunday night. I've thought about it a little and thought it would be a good thread for anyone looking for ideas or who has ideas to share. I'll start by summing up what seem to me to be the most logical catagories of original and custom maps. I will make 3 major catagories, I think most maps can fit into at least one of these, sometimes several, but usually one has a stronger effect on the style of the map. Pertains to natural surroundings (ie:the enviroment). Probably a 'smaller' grouping as the are few very unique settings, so a small group with a wide influence. Desert (probably the most used, most thought of when thinking of TF2). Of course Dustbowl, Badlands are the best examples. Red dirt, Cliffs, Cacti, Mining. I don't know how to further catagorize this as it covers a wide range of desert characteristics. 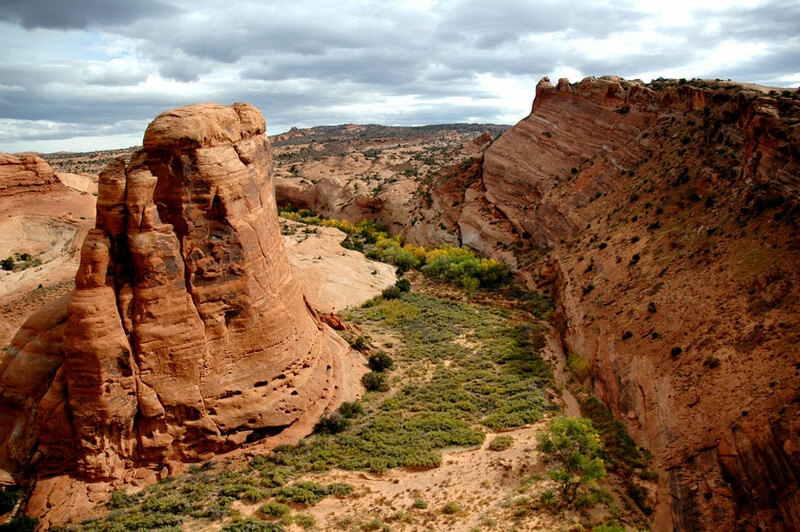 For example, the red sandstone cliffs bear a very strong likeness to places like Sedona, Az. ( both USA). While both places are plentiful in sand, hot climates and sandstone cliffs neither have Saguro Catus. , but no redstone cliffs. Actually more volcanic rock and white sandstone. Then there is Joshua Tree, NV (USA) which has joshua trees (TF2 has these), Agave plants, red dirt (but not cliffs) and no sagura cactus as far as I know. Another desert climate would be the Sahara Desert. Basically sand. Probably not good for a game level. But it is a type of desert. Of course Lumberyard is the only Valve map currently in this setting. Really it's a high mountain forest, but still in the temperate zone. This zone covers a large range of the north and south hemishperes. Basically a four-season climate. So there are hints of snow and mountains in the skybox, but obviously a summer enviroment and no snow in gameplay area. Green vegetation and what I assume is granite rocks. Quite a few custom maps are jumping on this bandwagon. Not so much a natural enviroment but very strong influence on TF2. Granary is probably the most noteable official map. There isn't really much natural enviroment around this map. On one side is a dock, so it is at the ocean, but the other side seems to be more like the great plains. Neither of which is probably the best gameplay enviro because of the lack of features to the landscape. Flat horizon, but good fillers for a map so chock full of buildings that you don't noticve what's beyond. The Well fits this setting also. Hydro is very industrial but is in a strong desert enviro also. Merdian is the prime example. It's on a tropic island, palm trees, grass huts, volcano and temple. As mentioned above, some valve maps lean towards this enviro, mainly industrial maps but they don't seem to favor it over the industrial setting. I think the arena map Harvest would best describe this setting. rolling hills, long views, no mountains, no ocean. Farming is big here. There is a ctf on a cruise liner. another possible option would be underwater, maybe even submarine. Moonwalk is a good example. Either in a base or on a spaceship. the WIP Icefield probably fits this bill better than anything currently. The setting is in snow, possibly and arctic enviro that never melts off. Haven't seen this yet, maybe some swamp areas would be cool. Don't get in the water, the gators'll getcha. This group isn't as strongly defined by the natural surroundings as it is by culture and man's creations. Egypt is a map that fits this bill. Obviously in a desert, but the eguptian motif is much stronger than the desert motif. American Western (cowboys and indians). TF2 desert maps have a strong leaning towards this with the mining maps although not really what I'd call western. The industrial theme could almost as easily fit here as it is really themed after America in the 1950's. In fact I'd say if TF2 has a 'cultural setting' this is it. IMO NO Valve maps fit this bill. It's really more of a custom thing. The anything goes catagory. A wide range of maps could fit here and in most cases would be considered by most as gimmick maps whether or not you think that's a bad thing. My map impressionist fits here. On one hand it's a 'gimmick map' (sniper only), a rat map (because you are in paintings, thus really small) and it fits the abstract catagory well because it gives you an abstract view of the world. (while also incorpoarting desert and industrial themes). Rat maps because of the 'skewed' perspective. Toyfort the most obvious, bedroom is another. One is on a table top in castles made of playing cards. All a take on being very very small, most are within a building but don't fit any certian enviroment. Video games. This seems to be a fairly new development where you are actually inside a video game. Ie: Donkey Kong and Pacman. Well, that turned out really long. Hopefully it helps if anyone is looking for a theme, maybe it'll help people think of a theme that isn't being used, we can always use more. Subterranean is another environmental one. There aren't really any map underground or in caves that I've played. I've had an idea for a Bayou map filled with gators in some areas of the mucky water, not too good at the map making myself but I think it would be awesome to see it done. IMO sawmill has a bayou feel to me. Especially the back areas, where the logs run across the pond. Maybe its just me. Nice little guide, though. Lots of good ideas there.